USA - As we head towards winter in the Northern Hemisphere, there is still time for warmer places to enjoy some outdoor entertainment before the temperature drops too much. 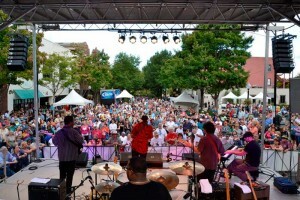 Such is the case in Greenville, South Carolina, where Alcons audio systems are a feature of the Fall for Greenville civic festival. Taking place over three days in mid-October, Fall for Greenville is a unique festival which promotes the city’s notable and varied culinary excellence, accompanied by a soundtrack from six stages of live music. Equipped by local rental company Audio Solutions Inc, three of the stages featured Alcons audio systems. "We have invested in Alcons because we honestly believe them to be the best sounding systems available," says Audio Solutions owner Alan Simonton. "We still have some systems by another manufacturer, but we’re moving to the Alcons systems because they not only sound better, but the pattern control and projection capabilities are unmatchable." At the festival’s main stage, Michelin on Main, Audio Solutions deployed eight Alcons LR14 ultra-compact pro-ribbon line-arrays per side and four BQ211 carbon 21" subs, powered by two ALC Sentinel10 4-channel amplified loudspeaker controllers. As one of the event’s feature stages, it showcased a range of popular local artists playing the styles of music typical of Greenville. With an emphasis on folky acoustic guitar and instrumentation, the Alcons system helped the all-important upper frequencies to ring out. Independent audio engineer Kevin Mitchell was brought in to mix this stage and was impressed with the dynamics of the Alcons system. "You can mix anything from blues to stadium-type rock’n’roll. It sounds really good for such a small box. There was no harshness, but it was still loud and it covered all the area that needed to be covered, from the front to the very back," he says. "Now I’ve heard the LR14, I’d like to try the bigger Alcons systems as well." On the Jazz Stage, five Alcons LR7 micro pro-ribbon line-arrays per side were complemented by two BQ211s, powered by another ALC Sentinel10. Here the Alcons array was contoured to match the space of the natural amphitheatre in front of the stage. "The LR7 has a small footprint, with excellent pattern control and audio fidelity," notes Chris King, production manager for Audio Solutions at the festival. Meanwhile, at the America’s Satellites Beer Garden stage, the system comprised two Alcons QR36 pro-ribbon line-source columns, two QB363 triple 12" array subs, a pair of BQ211 subs and another ALC Sentinel10. "We wanted to have something that would draw people to the stage area, which was along a side street," says Chris. "It was a very long, flat listening area, so we needed to project all the way down to the end of the street, but to have a very tight pattern control. The throw of the QR36 was phenomenal and the fidelity is amazing. "Overall, the flexibility of the different systems allowed us to put a perfect system in place for each space. The consistency of sound from all the Alcons systems was excellent. We’re really excited to have added Alcons products to our inventory. We very much appreciate the partnership we have with the Alcons’ team and are constantly looking for opportunities to deploy our systems."